The key to any successful product is a strong online presence. Your audience is finding content in more ways than ever before, so there are a wide range of digital marketing opportunities available to you. At Mango, we’re always on the lookout for new online trends that may help our clients to make the best of their digital brand. As sector experts we are able to understand the specific opportunities relevant to you. Whether you need a new website or help in attracting audiences through email campaigns, social media or digital advertisements, Mango Marketing is here to help! The hub of any successful digital marketing campaign is a user-friendly, mobile-optimised website. Mango Marketing can help in designing a site that will inform and engage your potential new customers, encouraging them to pick up the phone or drop you an email! Websites need to be consistently monitored to uphold Search Engine Optimisation (SEO) to ensure that you don’t slip down that all important list of Google search results. At Mango, we can help with copy writing, blogs, keyword analysis to keep your site fresh and visible. 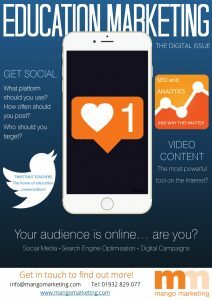 You may think that social media is just a place to keep in touch with friends, but with the huge number of people that engage with social media every day, there’s a whole audience you can tap into through social brand building and targeted adverts. Need a hand with your hashtags? Let us know! As well as print adverts, publications are now offering a variety of digital advertisement options. Need a guaranteed way of getting in front of your audience? Get advertising on the sites they read! Get in touch if you’d like help with buying and designing effective adverts! For more information about our Digital Marketing services, get in touch!